The aim of this site is to be a forum for the thousands of people that want to hold BAE to account for their actions – and that’s what the main comment thread of this site is for. But we recognise that not everyone agrees with us – so we’ve created this space for those debates. If you want to take issue then this is the place to do it! To keep things clear we’ve moved some comments from the main thread here. CAAT should return to its style of campaigning ten years when it organised high-profile stunts and demos against BAe rather than uninspiring law firms such as Leigh Day working on a pro bono basis to fight battles they can never win. This latest failure has, in effect, given the SFO’s decision a endorsement by the High Court and ironically assisted the arms trade. If CAAT cannot succeed when we have a Labour government what chances is it going to have under the Tories? Protests at arms fairs, stalls on the high street, emails to parliamentarians and letters to the media – these and much more are all part of the mix of complementary activities that we need to use to end the arms trade. No one method alone is sufficient. Using the law is also part of this. Taking action when the Government stopped the BAE Saudi investigation revealed much to many about the links between government and the arms industry; challenging the plea bargain this time, when our barristers felt we had a strong case based on the evidence then available, has revealed problems with the investigation and prosecution of corruption. More appropriate campaigning groups are likely to take this forward. Leigh Day’s support with these legal action, and behind the scenes in other work, has been vital and we are very grateful to them. Regarding Labour and the Conservatives, there is little difference in their stated policies. Whatever happens the campaigning, in all its forms, will be as necessary as ever. Make sure you take part in CAAT’s election action. 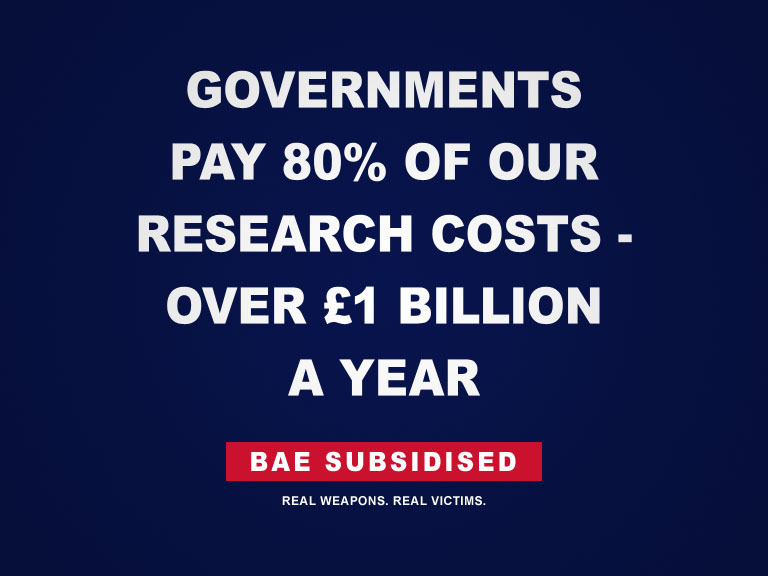 Finally, CAAT is organising protests against BAE – this site is about mobilising for the AGM! You can find details about the action at https://baepeoplesjury.caat.org.uk/the-peoples-jury-the-bae-agm/. Do join us. We try to persuade armaments factories to divert into a ‘greener’ future, as we also don’t wish workers to lose their jobs! Surely as BAE Systems lose more & more contracts from the MOD, it makes sense! As a Marconi, BAe and BAE Systems employee of many years standing I have a slightly different perspective from most people. I believe there will be arms sales, whatever we might personally prefer. I believe we have to be able to protect ourselves as a nation and that it would be foolish not to have an indigenous capability to support our defence. I believe there are choices with should be made on ethical grounds about which nations our arms manufacturers should be allowed to deal with. Such decisions should be made by the government, representing the wishes and best interests of our people. From my perspective within BAE I see that the government does regulate who we deal with. I see the company being very forceful with its staff about business ethics and ethical behaviour. I see a senior management whose membership is almost completely different from those who were in position when the government-to-government deal between the UK and Saudi Arabia, which BAE services, was first agreed. However I also detect the hidden realities behind this. Government control of exports is always tainted by politics and the corruption which has been shown to be present in many of our politiicans. The senior management community believes itself to be above its own rules and policies and even above the law. This view, this culture of invulnerability, has been supported by the SFO fiasco – going after the company rather than the individuals involved, and failing. It has been underlined by the Haddon-Cave inquiry into the Nimrod XV230 crash which attacked low-ranked middle managers by name but said nothing about the responsibility of the Engineering Director – a responsibility which is supposed to justify his enormous salary. BAE has an Ethics Helpline and Grievance Procedures and pretends to support “whistle-blowing” but woe betide anyone who even thinks of complaining about a senior director. The Arms Trade is unethical not because it exists – the nature of humans all over the world ensures that – but because we allow our politicians, corporations and senior industrialists to get away with it. Which is why pressure groups like CAAT are needed to remind voters of what is being done in their name. For me the name “Campaign Against Arms Trade” implies a naive belief that we can stop make arms and the world will suddenly become sunny and happy-clappy and there will be no conflict. I believe this implication deters some people from giving support or even listening to CAAT. If you were the “Campaign for an Ethical Arms Trade” more people might take notice. Just my personal view.